And once again, we’re here talking about Cannon Films. Those folks just seemed to produce a high volume of titles loved by cult audiences. 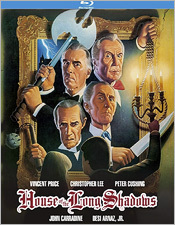 In 1983, they had the idea of capitalizing on horror fans by getting together four of the biggest genre names in the business: Vincent Price, Christopher Lee, Peter Cushing, and John Carradine. The result was House of the Long Shadows which, by and large, isn’t quite the horror masterpiece you would hope for with this caliber of talent. Like several movies before it, House of the Long Shadows is based upon the novel “Seven Keys to Baldpate” by Earl Derr Biggers. Its story is pretty straightforward: a pulp writer bets his publisher $20,000 that he can write a much more classic novel within 24 hours, provided that he’s given the proper environment in which to write in. He then goes away to stay at a seemingly unoccupied Welsh manor in the countryside, a family home wherein the family has a dark secret locked away that is causing them to be bumped off one by one. Cannon also sought out the directing talents of Pete Walker, who had since retired after making several exploitation horror classics like Frightmare and The Flesh and Blood Show. Also cast in the movie was Pete Walker regular Sheila Keith, as well as Desi Arnaz, Jr. The latter casting choice probably had a lot to do with the film’s stigma amongst the film community. His acting abilities are, well, questionable at best, and without a strong lead, the mediocre storyline including its not one, but two twist endings, feels like a pointless endeavor to follow through on. But House of the Long Shadows lives on these many years later because of the horror masters that were cast in it, none of whom were given anything of substance to do in the movie. Even their entrances into their first scenes are punctuated using shadowy reveals and over-the-top score. It’s completely exploitative, which again, was a lot of the whole ballgame going on at Cannon Films. There are some Pete Walker touches from time to time, but overall, it feels more like a committee movie rather than a personal one. Still, one can’t deny the charm of a movie with Price, Lee, Cushing, and Carradine in leading roles and, better still, in the same scenes together, acting together. Perhaps that’s enough to give the movie a bit of a pass for its faults... perhaps. The Blu-ray presentation of House of the Long Shadows contains a very healthy transfer of a very, very dark film. Grain levels, or at least textures, are much less apparent than most films of this vintage, but there is some strong detailing to be found, especially in close-ups. The color palette is very good, and skin tones are very accurate. Blacks are very solid, but a lot of shadow detail is lost to how dark the original photography is. Contrast and brightness levels are mostly acceptable, and there doesn’t appear to be any noise removal or any other digital anomalies. There is some minor film damage left behind, which is mostly black speckling and occasional vertical lines, but overall, it’s a very solid presentation. The lone audio track, which is an English 2.0 DTS-HD track, is very much the same kind of quality as its visual counterpart, which is problematical, but enjoyable. Dialogue is mostly clean and clear, save for sometimes when it goes a little too quiet. The score and sound effects are supported quite well, with some decent heft to them, as well as some nice atmospherics. Unfortunately, there are no subtitles included. The extras are a little light, but well worth digging into. They include two great audio commentaries: one with director Pete Walker and the other with film historian David Del Valle. There’s also an interview with Walker, the film’s original theatrical trailer, and trailers for Madhouse and The Oblong Box. House of the Long Shadows isn’t a top tier horror classic, that much is true, but there’s a little something for genre fans to discover. And who knows? They might just like this movie more than I do. The bottom line though is that this is a very solid Blu-ray release and well worth a look.